The need to speak up about human rights abuses in Balochistan cannot be overstated. However, Indian Prime Minister Narendra Modi ostensibly expressing solidarity with the people in one the most underreported conflict zones in the world on August 15 was arguably a case of the worst possible person speaking up at the worst possible time. Modi’s message wasn’t just inopportune because it came amidst turmoil in Kashmir, where 66 people have been killed in the past month. It also came a week after the attack on Quetta’s Civil Hospital, which left 74 people dead in a bombing claimed by ISIS and Taliban faction Jamaat-ul-Ahrar (JA). Nearly an entire generation of lawyers was eliminated in the Quetta attack, many of whom were fighting cases over the very human rights abuses that Modi pinpointed in his speech. Not only did the Indian premier brazenly try to deflect attention away from the violence in Kashmir, he also exacerbated the human rights crisis in Balochistan through his opportunistic statement. The separatist movement in Balochistan has evolved out of a struggle for autonomy, which has its roots in the Pakistani state depriving locals of an economic share in the province’s own resources, whether it’s monopoliziaing share in Sui gas revenue in the 1960s or transferring the infrastructural benefits of CPEC eastward in the 2010s. Balochistan has been reduced to a geostrategic loci, central to Pakistan’s self-aggrandizement as an opulent crossroads for global powers. Baloch activists being lifted and dumped by the Pakistan Army is an extension of this dehumanization of Balochistan, where the ongoing fifth military operation has extended for more than a decade. Not only are Baloch activists short of legal representatives after the Quetta bombing, Modi’s speech has further rubberstamped the tag of being “Indian agents” on the Baloch, who are now posthumously proving their faithfulness to Pakistan by becoming “martyrs” for a road network. Modi’s explicit mention of “gratitude” from the people of Balochistan is a departure from the joint Indo-Pak statement from 2009 when the then premiers Yusuf Raza Gilani and Manmohan Singh met on the sidelines of the Non-Aligned Movement summit in Sharm el-Sheikh. This was perhaps purposeful; Manmohan Singh agreeing to the mention of Balochistan in the joint statement was touted as a “blunder” by the Indian media. However, Modi’s statement this week has firmly established India’s support for the Baloch insurgency as far as the Pakistani establishment is concerned. In addition to leaving the Baloch at the Pakistani establishment’s mercy, Modi has also dented the Indian stance over Kashmir. How does New Delhi now ask Islamabad to not interfere in “India’s internal matters” in Kashmir, when Modi is doing the same in a Pakistani territory that it doesn’t even stake a claim to? Furthermore, by mentioning the people of Gilgit-Baltistan and Pakistan-held Kashmir as two separate groups, he has jeopardized India’s claim to the entire state of Jammu and Kashmir as it stood under pre-Partition Dogra rule, which included the Gilgit-Baltistan region. Modi’s use of anti-Pakistan rhetoric in the lead up to state elections in Kashmir and Bihar, or his claim that India had a role in breaking up Pakistan in 1971, can be shelved as jingoistic political sloganeering. However, his barefaced aggravation of turmoil in South Asia’s two major conflict zones showcases his willingness to sacrifice human rights at the altar of geopolitics, in turn negating his self-promotion as a regional and global leader. Less than eight months after Modi’s Lahore visit, which was touted as heralding a new dawn in Indo-Pak relations, bilateral ties have gone completely pear-shaped, sinking to their nadir in the two years since the BJP government took over in India. While Pakistan has invited India for talks over Kashmir since Modi’s remarks, it is hard to see the BJP government willing to give up on the domestic gains that have come from the August 15 speech. Modi’s foreign policy successes, which have seen India draw closer to Bangladesh, Iran, Afghanistan, and even Saudi Arabia, have clearly alienated Pakistan. This perceived deliberate isolation of Pakistan is also bolstering the BJP’s popularity back home. However, Modi’s political and diplomatic gains are coming at the cost of Kashmiri and Baloch lives. While many Baloch nationalist leaders have hailed the Indian PM’s statements, it is more a case of clutching at straws at a time when the world continues to turn a blind eye to the crisis in Balochistan. Meanwhile, civil society activists rallied against Modi’s claims, to further establish the Indo-Pak battlefield in Balochistan, which extends to the Sistan and Baluchestan province in southern Iran, where New Delhi and Tehran have been collaborating over the Chabahar Port. For India, this battlefield involves China as well, which has invested $46.2 billion in the China-Pakistan Economic Corridor, banking on stability in Balochistan. While Balochistan and Kashmir were condemned to being transnational regions by boundaries drawn by the British rulers scrambling out of the region, the local populations continue to strive for their identity and autonomy. And it is evident that for Pakistan, China, or India alike, the geostrategic importance of Balochistan supersedes the value of Baloch lives. 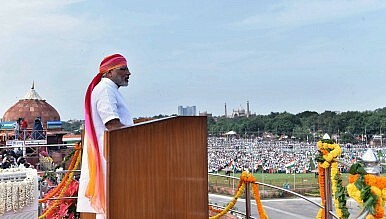 Remarks by Modi and Sharif at their independence day celebrations signal the end of attempts at reconciliation.